Step 1: Together we develop long-term, forward-looking risk and return assumptions that lay the groundwork for setting return objectives and assessing risk expectations based on your overall plan, your investment goals and risk tolerance. Step 2: Collaborating with you, we construct asset allocations designed with your personal investment objectives and tax considerations in mind. Step 3: We select experienced asset managers with a demonstrated ability to prepare an investment plan for you. Step 4: We proactively frequently review each element of the program in an effort to ensure that policies are being implemented, managers are adding value, and risk is being controlled. Step 5: You receive full disclosure through education about risk and through reports of all fees and performance. 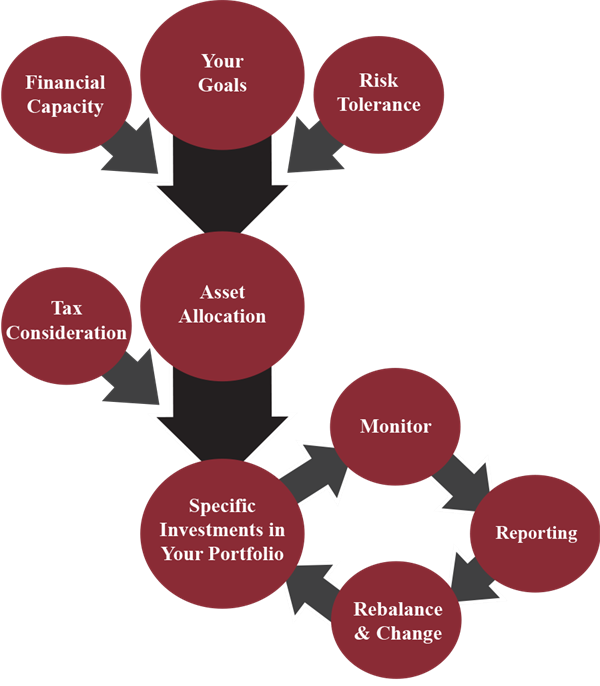 Step 6: We will rebalance your portfolio annually as needed and make any necessary money management changes if the situation warrants.